2002 was a bit of a dud year for Japanese animation. Studio Ghibli seemed to have hit their peak with the box-office busting Spirited Away in 2001, with last year's The Cat Returns going off like a damp squib in comparison. Elsewhere, amongst the usual backdrop of kids holiday releases such as the most recent instalments of the Crayon Shinchan and Doraemon, only the belated release of Satoshi Kon's Millennium Actress, despite garnering mixed reactions from viewers, inspired much in the way of hope for future developments in the medium. Insiders have drawn attention to the number of those working in the field leaving in droves for the computer game industry, and much of the hands-on work being farmed out to Korea or China, where the workforce is cheaper. All this compounded with the costly flop of the Japan/US co-production Final Fantasy: The Spirits Within (directed by Hironobu Sakaguchi) from the year before and it's perhaps unsurprising that no small number of nay-sayers have appeared on the horizon predicting that the halcyon days of Japanese animation are all but dead and gone. And yet the outlook from this first quarter of 2003 is somewhat more positive. Obviously the big news has been the Best Animated Feature Oscar for Spirited Away at the 75th Academy Award Ceremony - a remarkable achievement for Hayao Miyazaki, doing full justice to some 30 years of top-notch work within the industry. By the time you read this, one of the earliest personalities of Japanese TV animation, Astro Boy (a.k.a. Tetsuwan Atomu) will have returned in a brand new series financed by Fuji TV, to celebrate the fictitious birthday, April 7th 2003, of Osamu Tezuka's enduring creation. A revamped Space Battleship Yamato should also be honing into view on Japanese TV screens later this year, and Steamboy, the latest release of one of the most feted directors in animation, Katsuhiro Otomo (of Akira fame) will be looming large on the big screens of Tokyo in the latter of half of 2003. In fact, Japan's recent animated offerings look a good deal more inspiring than the majority of live-action releases that have been churned out over the past year or so. It's true, The Cat Returns may have not made as much money as Spirited Away, but it was still the top grossing domestic production in Japan last year (and a rather nice film, to boot). Let's face it, the Japanese are renowned throughout the world for their animation, and it is still something they excel at. But let's not forget that outside of the mainstream there has always been, and is still, a very active avant-garde exploring all of the numerous routes for the animator to take, from the alternative combinations of Final Fantasy's photographic realism through Disney-styled anthropomorphism and into the realms of pure abstraction. Focuses on Japanese animation seldom wander far from this first approach, with the various merits of character or background designs being the primary topic of discussion in such robust narrative-based epics as Akira, Ghost in the Shell or Perfect Blue. The main criterion would seem to be that the end aspiration for an animation is for it to look like a "real" film. 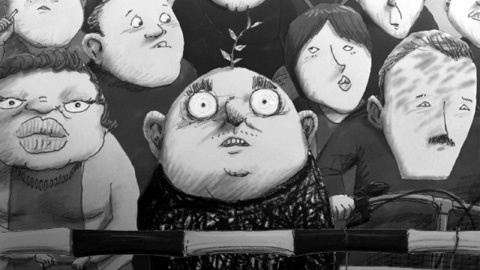 But against Spirited Away, let us not overlook Japan's second nomination at the 2003 Academy Awards, in the Best Animated Short section, for Koji Yamamura's Mt Head (Atama-Yama). It may not have picked up a prize, but Yamamura's bizarre 10-minute plunge into total weirdness certainly points to the numerous alternative routes that Japanese animation is currently taking outside of Ghibli's more mainstream fantasy spectacles. A small seedling springs from the top of a mean-spirited man's balding pate after he accidentally swallows a cherry pip. Initial attempts at snipping it off proving unsuccessful, we chart the tree's growth throughout the four seasons. When a crowd of drunken revellers congregate beneath it for "hana-mi", the cherry blossom viewing season in spring, discarding empty beer cans and cigarette ends, in frustration the man tears it out. The gaping pit left in his crown soon fills with water and is invaded by swimmers during the hot summer months, further adding to his angst. Set against the discordant tones of the shamisen coupled with kabuki style narration, out of the five films nominated in its category Mt Head was apparently the only one which didn't utilise a computer, and allegedly took two years to make. Yamamura's work has been picking up awards at festivals all over the globe ever since his debut in 1987 with Aquatic (Suisei). A retrospective of Yamamura's works, was recently held at Eurospace in Tokyo in April 2003, and a DVD is also available. Of course, it is easy to ignore that the field of animation encompasses an entire world outside of 2D cell animation, with such a variety of works as CGI modelling, claymation and stop-motion puppet animation falling within its scope. The latter has been the focus of a certain Kihachiro Kawamoto for over the past 40 years, and for me has to represent one of the best-kept secrets of Japanese animation. For several weeks now I have been utterly entranced by a DVD put out in Japan entitled Kihachiro Kawamoto Film Works, which at 151 minutes in length, AND sporting English subtitles, is well worth 5,800 yen of anyone's money. Containing 11 dreamlike and hauntingly atmospheric works, the disk seems to take in the majority of the director's work dating from his first major piece in 1968, the 14-minute Breaking of Branches is Forbidden (Hanaori). His other credits outside of this disk include creating the puppets for two live-action historical puppet drama series produced by NHK TV, The Romance of the Three Kingdoms (Sangokushi, 1982-84), and The Heike Story (Heike Monogatari, 1993-95), and a 93-minute animated feature entitled Rennyo, A Priest and His Mother (Rennyo to Sono Haha, 1983). Graduating from the National University of Yokohama in 1944, Kawamoto began his career working for two years in Toho's animation department, before moving over to Czechoslovakia where he studied under the Czech stop motion animation wizard Jiri Trnka (1910-1969). The final film on the DVD, the Czech co-production Briar Rose or The Sleeping Beauty (Ibarahime Mata Manemurihime, 1990), sees Kawamoto returning to Trnka Studios in Prague for a fantastical trip into fairytale fantasy, closely modelled on the stories of the Brothers Grimm and shot with a hallucinogenic clarity. At 25 minutes long, To Shoot Without Shooting (1988) is of similar length and also a co-production, this time with China, and again is structured along a folk tale inspired narrative, this time about a young Chinese archer's trials to reach the pinnacle of his field. After learning to shoot a marked willow leaf from a tree at 100 paces in the blink of an eye, he is dispatched on to his next mentor, whose methods to teach him to lay down his bow and "shoot without shooting" seem a little less orthodox. The tale is based on the work Meijin-Den by the writer Atsushi Nakajima (1909-1942), and has a poignant message for these troubled times, as Kawamoto himself spells out on the disk: "The theme of the film is intended to suggest a pattern of human intelligence serving in the interest of peace." Outside of these two, most of the works contained in the package are more obviously informed by a Japanese aesthetic, resulting in three absolutely stunning pieces. The 19-minute Dojoji Temple (1976) is the most traditionally inspired. A tale of a young monk tempted by a fair maiden who transforms into a vicious sea serpent and pursues him until he seeks refuge in a distant temple, stylistically it resembles the yamato-e narrative picture scrolls of traditional Japanese art, with its watercolour backdrop of flattened compositions and non-converging parallels running to the horizon. With virtually nothing in the way of dialogue, it is one of the most lyrical and mesmeric of the works on this disk. Shorter at 8 minutes is The Demon (Oni, 1972), which with its plain black backdrops and minimalist design seems more explicitly inspired by the traditional theatrical forms of Noh and Kabuki theatre, and bunraku doll dramas. It tells the tale of two brothers that go off to slay a demon after it has attempted to sever the arm of the younger one. For me, the most dazzlingly beautiful film on the disk has to be House of Flame (Kataku, 1979), in which a traveller, whilst resting for the night outside in the countryside, is approached by a beautiful ghostly maiden who tells him a strange tale of how two rivals fought and killed each other for her love. Kawamoto empties his entire stylistic bag of tricks here, both in terms of the quality of the puppet animation, and how it is melded with more conventional 2D techniques, such as the painted matte foregrounds of flames and water as the young maiden finds herself plunged into the very depths of hell itself, both masking out and balancing the colour composition across the frame. The disk also contains a number of Kawamoto's non-puppet animations of which the most interesting is the 12-minute The Travel (Tabi, 1973). Rendered in flat 2D collage style, The Travel is reminiscent of Terry Gilliam's work for Monty Python, cross-referencing well-known works by surrealist artists such as Salvador Dali, Paul Delvaux and MC Escher in a deeply Freudian tale in which a young girl wanders lost through a cavernous museum space doubling as her subconscious. A Poet's Life (Shinjin no Shogai, 1974) is based on a story by Kobo Abe (1924-1993), a number of whose works, such as Woman in the Dunes and The Face of Another were adapted for the screen by Hiroshi Teshigahara in the 1960s. Similar to Teshigahara's films, Kawamoto presents us with a fable which is as thought-provoking as it is incomprehensible, this time detailing an old woman working at a factory mass-producing clothing who one day manages to fall asleep at the loom and weave herself into the fabric of a woollen jacket. When her son tries to sell the jacket, he is fired from the factory. Rendered in gritty greys, again in flat 2D cut-out, this latter work points to yet another strand of Kawamoto's creative spectrum. I cannot urge any one enough to check out this release. Kawamoto's work is so vivid, so exquisite and so refreshingly unique that I was almost in tears when I'd come to the end of the disk. The good news is that Kawamoto is currently at work on a new project, The Book of the Dead (Shisha no Sho). I hope this has better success in reaching audiences outside of Japan. Working in a similar vein in puppet animation with similarly traditional folk-inspired stories is Tadanari Okamoto, behind works such as the 18-minute long Praise Be To Small Ills (Namu Ichibyo Sokusai, 1973), the 25-minute The Magic Fox (Okon Joururi, 1982) and the 19-minute A Restaurant With Many Orders (Chumon no Oi Ryoriten, 1991), though none of these appear to be on available on video at present. Of course, unknown as he may be to Western audiences, Kawamoto's name is pretty well established within anime circles back home due to his position as President of the Japan Animation Association, a role he inherited from Astro Boy creator and the grandfather of the modern manga Osamu Tezuka when the latter died in 1989. The JAA regularly put together programs to promote the newest and best of Japanese animation as well as old classics. A recent session put on by the JAA for free in Koenji in Tokyo, running 22nd-25th March 2003, entitled Into Animation 3, hosted no less than five programs (including one especially for children) that celebrated the enormous scope and inventiveness of those working in the field. I have to confess, I only made it to one of the programs, but hopefully this selection will give an idea of the diversity of material that was shown. Of the better-known works, Kawamoto's own The Travel played alongside Yamamura's Mt Head, a trailer for the new Astro Boy TV series and Mini-Pat, a small comic short based on the Patlabor anime films that screened in theatres before last year's Patlabor 3 movie. There was more abstract work, such as the two minutes of whirlpools and watery mandalas from Yumi Shima, the ghostly silhouettes within a spinning wire-frame cube accompanied by the strains of Mahler of Yokio Tanabe's Inner, and Maya Yonesho's five-minute Learn To Love, which consisted of a series of pastel inkblots appearing at random and swirling across the pages of a notebook set to a trance soundtrack with the words "I Love You" chanted like a mantra in a variety of tongues. Keizo Kira's Koko de Aou (trans. "Lets Meet Here", 2001) was an animated video set to a cute little song especially commissioned for NHK TV and represented probably the most conventional-looking of the 15 films in Program A of the first day. The biggest laughs went to Masahiro Katayama's KA2, a two and a half minute skit, which as its name subtly suggests, is a homage to Akira Kurosawa, beginning with a factory chimney stack bellowing out peach coloured smoke (cf. Kurosawa's High and Low) and ending with the tempting proposition of a mad red-bearded surgeon grafting the head of Saddam and Bush onto the same Frankenstein-like torso and leaving them to tear each other apart. The most satisfying offering for me was the 14 minutes of Saku Sakamoto's Fisherman, which featured a desert planet strewn with marooned shipwrecks of famous ships - the Titanic, the Battleship Yamato etc. Into the frame loom a number of tribesmen, surveying the rugged terrain, before a giant flying fish bursts from the ground, and the fishermen leap onto their own fish for a frenetic, three-dimensional chase across the barren landscape. Using a combination of hand-drawn techniques for the warriors, and CGI for the fish (I was particularly won over by the impressive shimmering hues of the rainbow trout), Fisherman was a triumph in both terms of the imagination of its conception and the proficiency of its execution, and, as with all the work on display here, points to the fact that where the experimental avant-garde lead, the mainstream will surely follow. This was a fact well known to the three gentlemen who formed the "Association of Three Men" (Sannin no Kai) in the 1970s, Hiroshi Manabe, Ryouhei Yanagihara and Yoji Kuri, whose work was also showcased during the Into Animation 3 event in a special program all of their own. During the 70s these three illustrators and animators decided to distance themselves from the more commercial work being pursued by major studios such as Toho, to instead concentrate on pursuing the field as an artistic endeavour in its own right, introducing more experimental work from Europe to Japanese audiences and each pioneering their own styles. I unfortunately did not catch any of these films, but for any interested parties, I suggest you check out the DVD of Yoji Kuri Film Works, containing 18 animations made from 1960 to 1977 - there's no subtitles listed, but that's because each of these flat-looking 2D sketches, with intriguing titles such as The Human Zoo (Ningen Dobutsuen, 1962) plays completely without dialogue. Indeed, there's an entire world of animation away from what those of us outside of Japan are used to seeing. Unfortunately, much of the more experimental stuff still remains incredibly difficult to see and virtually undocumented in English language sources. To the multitude of seminal names quoted above, I'd also like to add cross references to such people as Renzo Kinoshita and Kohei Ando for those curious to chase up on and report back to us. All of the figures remain important pioneers in the field of experimental animation, whose short film formats and innovative, unconventional technique has kept them shielded from us for too long. Let's hope it's not for too much longer.